The Bakersfield Californian is an independent, family-owned newspaper. It is the direct descendent of Kern County's first newspaper, The Weekly Courier, which was first published Aug. 18, 1866, in Havilah, Calif. At that time, Havilah, a small mining town about 50 miles northeast of the present site of Bakersfield, was the center of the 1864 gold rush, which brought the first major population influx to Kern County. The newspaper's name was later changed to The Havilah Weekly Courier. As the mineral wealth of the area became depleted, and the population moved southward toward Bakersfield, so did the newspaper. In 1872, the newspaper moved to Bakersfield and set up shop as The Kern County Weekly Courier. In 1876, the Courier merged with another Bakersfield newspaper, The Southern Californian, to form The Kern County Californian. The newspaper's name was changed to The Daily Californian in 1891 with the advent of daily publication. In 1897, the Kern County superintendent of schools, Alfred Harrell, purchased the newspaper. Harrell gave The Bakersfield Californian its present name in 1907. 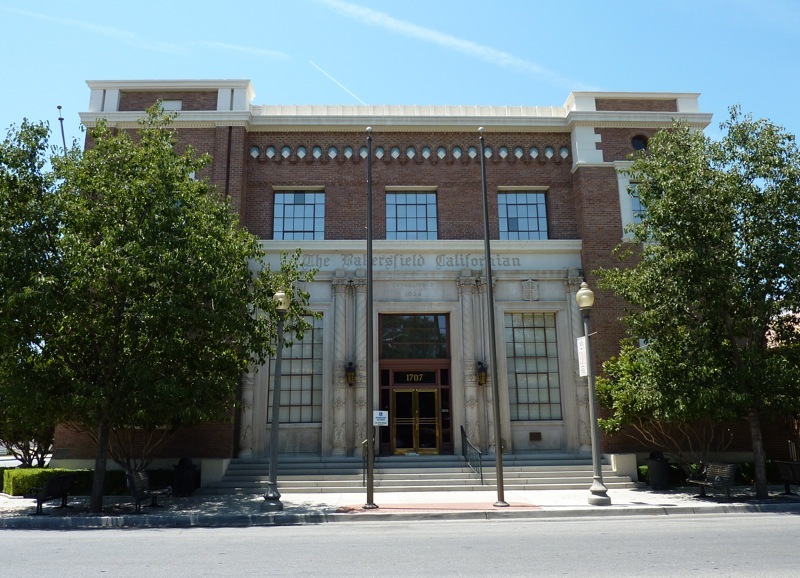 In 1926, he moved the newspaper into its present location in downtown Bakersfield at 1707 Eye Street. In 1983, that structure was placed on The National Register of Historic Places, the official list of the nation's cultural resources worthy of preservation. He served as editor and publisher of the newspaper until his death in 1946. During his almost 50 years in the newspaper business, he came to be respected as one of the best newspapermen in the country. In 1969, Harrell became the 24th person to be named to the Newspaper Hall of Fame. Under Harrell's leadership, The Bakersfield Californian was recognized as one of California's finest newspapers, winning over 40 state and national awards for journalistic excellence while he served as editor and publisher. After Mr. Harrell's death, his wife, Virginia, became president of The Californian. She held that position until her death in 1954 when the Harrells' daughter, Bernice Harrell Chipman, assumed the position of president. Mrs. Chipman died in 1967. Berenice Fritts Koerber, granddaughter of Alfred Harrell, was the president of The Bakersfield Californian from 1967 until her death in 1988. Through Mrs. Koerber's leadership, the company sustained strong growth and in 1984 constructed a $21 million state-of-the-art publishing facility. This facility is named the Harrell-Fritts Publishing Center and is located at the company's airport business center near Meadows Field, north of downtown Bakersfield. When the $21 million publishing facility was completed, The Californian became one of the most technically advanced newspaper companies in the United States. Included in the facility is a state-of-the-art offset press built by Tokyo Kikai Seisakusho Ltd (TKS) of Japan. The news and advertising copy gathered at The Californian's downtown offices is transmitted to the facility 6.3 miles away using an underground fiber-optic cable system, which was the first of its kind for a newspaper in the United States. In January 1989, Virginia F. Moorhouse, daughter of Berenice Koerber, was elected chairman and president of The Bakersfield Californian. She remains co-owner, publisher and chairman of the board and serves as president of The Bakersfield Californian Foundation, a separate and independent entity established to provide financial assistance to non-profit charitable organizations in Kern County. On November 5, 2018, TBC Media moved its operations from downtown Bakersfield to 3700 Pegasus Drive, Bakersfield, CA 93308.